We're the preferred tech partner. $60 million annual R&D investment. Your enterprise applications underpin your business. But too often they’re locked away within a complex IT infrastructure, and if your applications are trapped on older architectures you are not building for the future. Rehosting, often referred to by industry experts as "application migration" or "replatforming," represents safe and cost-effective modernization. It is the key to unlocking the value within your core business systems, reducing your total cost of ownership and delivering new functionality faster. 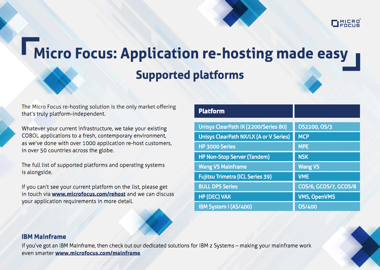 Micro Focus is the industry leader in application rehosting. Our track record in delivering fast, easy, and cost-effective application modernization, supported by high-quality, proven technology, is unrivaled. Micro Focus can help you with every aspect of your rehost journey. Read on to learn how. 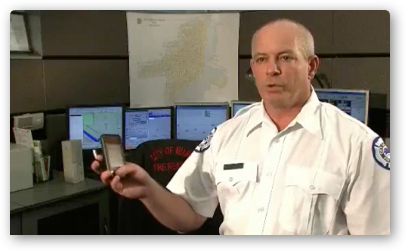 Watch the video to see how the City of Miami reduced IT costs by 90% through Application Rehosting. Even though long-established COBOL applications are powering the core system operations supporting today’s business, IT strategy is always focused on next-generation investment. The cost, complexity, and risk needed to deliver business change requirements will only continue to increase as a consequence of this shifting focus, decline in investment, and growing uncertainty around skills and resource availability. The core issue is often not with the application itself, but with the rigid infrastructure surrounding it. Awkward, outdated technology was never designed to support today's rapid pace of business change, let alone the next wave of technology—cloud, mobile, next-generation architectures—that few could have predicted when writing the original code. 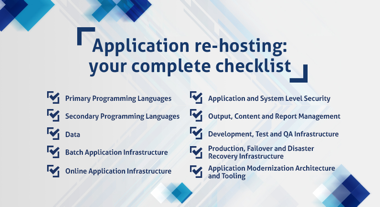 Application rehosting redeploys your current application logic on a new, modern platform. With Micro Focus, contemporary development tooling supports and maintains it within a distributed architecture. For Systems Integrators (SIs) and modernization partners, the Micro Focus rehost solution represents industry-leading technology for projects of any size. So the argument for application rehosting is straightforward enough. The question now is selecting the right technology partner and vendor. We have the track record and the credibility to make selection a simple process. Check out the Micro Focus rehost tab. Every major business decision must align strategy with the company’s strengths, firmly positioning them for future growth and competitive differentiation. Organizations entrusting their business-critical processes to Micro Focus are enabling the reuse of their core applications in a simple, easy and cost-effective way. In a risk-averse industry, credentials and credibility are important. And ours are impeccable. 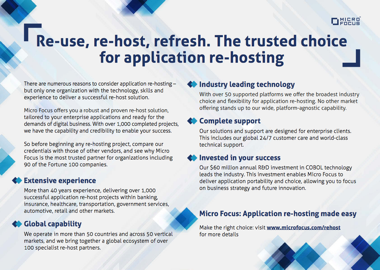 Working in partnership with our dedicated ecosystem partners, Micro Focus has delivered more than 1,000 successful application rehosting projects. Our rehosting technology is deployed across thousands of customer sites worldwide and rehosted business applications are accessed by millions of end-users. We are the market leaders in application rehosting technology. With more than 40 years of experience, Micro Focus’s record in the enterprise application space is based on domain experience and a rich history of enabling customer success. Our verified industry credentials demonstrate that we delivered what our customers wanted without compromising their infrastructure more than 1,000 times. The Micro Focus application rehosting solution is underpinned by an annual R&D investment of $60M. No one invests more on application rehosting technology than we do. Working with our partners, we deliver high quality, enterprise-ready rehosting solutions. Micro Focus also offers a wider choice of platforms: Windows, UNIX, Linux, Linux on z Systems, .NET, JVM and the Cloud. Enterprise COBOL applications written decades ago and maintained today run on the platform that best suits your business needs. Application rehosting with Micro Focus also means new life for existing COBOL applications enabled through smarter development tooling and robust platform choice. There are alternatives. But no other vendor can offer the same mix of high-quality technology, domain expertise and commitment to customer satisfaction that we deliver. You’re in safe hands. So how does it work? Check out the Methodology tab. The Micro Focus rehosting solution aligns future-proof technology to a comprehensive set of planning, management, and execution services supporting a complete or partial application rehost. Essentially, it is an offer on two fronts: technology and expertise. Whether you need the support and expertise of an application rehosting partner or just access to proven application rehost technology, your application modernization initiative is safe with Micro Focus. Our partners are the enablers of this powerful ecosystem partnership. They deliver high-quality application rehosting solutions every time because of their extensive domain expertise, knowledge of Micro Focus technology, and proven track record. We trust them with our reputation so you can trust them with your core systems. Our partner ecosystem is the trusted, cost-effective fast track to innovation. The process identifies current and target platform characteristics to effectively plan and control the transition to the new environment. It is well-rehearsed, proven, efficient, and repeatable. This graphic represents a high-level checklist for those considering rehosting. Each of these topics is explored in further detail in the Application Rehosting Readiness checklist on the right and through an application assessment provided through a Value Profile Meeting. Our solution is the only market offering that’s truly platform-independent. We take your legacy COBOL applications—whether Unisys Mainframe, Fujitsu, ICL, BS2000, DEC, or other—to a fresh, contemporary environment. Do you see your application environment below? If you don’t see your current platform listed, please get in touch and we can discuss your application requirements. "The bottom line is that we do a better job of saving lives because we re-hosted our core COBOL applications from the mainframe a to distributed environment. The re-host project led by Astadia and Micro Focus enables us to not only improve our current processes and performance, but will be used in the future for emergency services." "We wanted to streamline our development and standardize on a single environment so that our team of 25 COBOL developers can collaborate more effectively. Visual COBOL is a natural next step for us and we can see many benefits, including superior debugging capabilities which will enable earlier fault detection. We expect to see efficiency gains as well as a rise in developer productivity levels." "Thanks to Visual COBOL, we are now able to plan a progressive and integrated modernization strategy. Using Visual COBOL within our modernization project has given us unrivaled application platform stability, improved customer satisfaction and led to a significant cost savings. Visual COBOL was the right choice for our business."